Whether you need the high-volume, lights-out operation of the HCL or the convenience of an all-in-one publisher that will print and burn your BD-Rs, Media Supply has the Microboards automated system that will meet your needs. 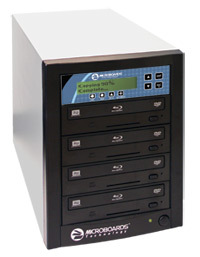 Copy Blu-ray Discs one at a time or by the thousands with the Microboards Blu-ray duplicator towers. 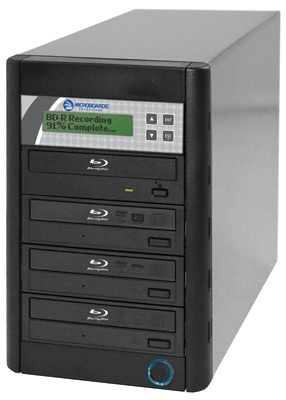 The 8X Blu-ray Disc duplicator towers have the ability to do more than just BD-R and BD-RW. Also copy CD-R(W), DVD-R(W), DVD-R DL DVD+R(W) all on the same system. A built-in 500 GB hard disk drive allows you to store multiple master disc images or extract audio tracks and mix your own discs. Connect to your PC or Mac via the system's USB port and drag and drop files to be recorded. The easy-to-use interface panel makes copying discs a cinch for the novice user, while maintaining the high-end power-user features, like disc verification mode. Features don’t mean a whole lot without reliability. Quality components and careful assembly, backed by industry leading service and warranty, make sure that you’ll be burning discs trouble-free for years to come. USB 2.0 Connection: USB connection allows you to burn files to first disc recorder only. No drag-and-drop to HD USB connection allows you to drag-and-drop files from your PC or Mac to the duplicator's hard drive. Burners, readers and hard drives are not covered in the second year.